I began with a sugar cookie dough. I find it much easier to make one plain dough, separate it and then flavour it, rather than making separate batches. Making two batches of dough just seems like a gratuitous amount of effort. So I split the dough into two parts. The larger portion I kneaded cocoa into, while the other just got red food colouring. One messy bench later, I had my domo dough. I spent a while trying to decide whether I should do the whole body or just the face. Plenty domo merch only shows that face, but in the end I thought that was taking the easy way out. To make the whole body, I cut a large rectangle of dough. I then cut out a rectangle for the mouth, formed the legs and cut two rounds for hands. Domo has much longer arms than that but I thought stylising them made it somewhat cuter, as well as less breakable. For the teeth and eyes I used royal icing. As soon as the teeth are added the likeness to the domo mascot is instant. 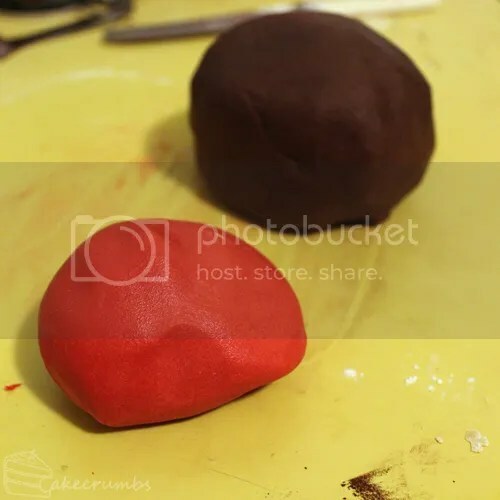 If you’re not comfortable piping, you can use fondant, lollies, or any other medium you’re comfortable with. The cookies are two cookies sandwiched with a chocolate fudge. The back cookies are plain, meaning there’s no mouth. Stir in flour cocoa in two batches; knead dough on a lightly floured surface until smooth. 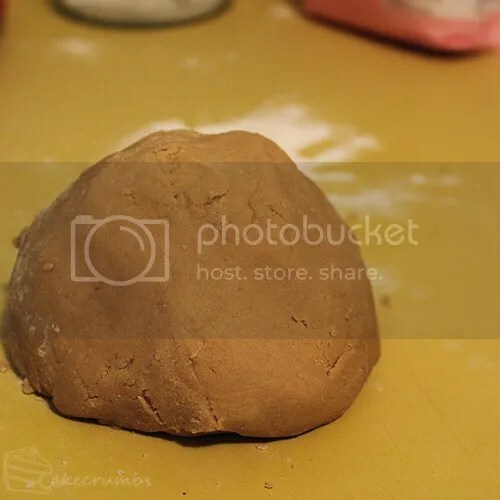 Set aside 1/8 of the dough. Knead cocoa into the largest portion of dough, knead red food colouring into smallest portion of dough. 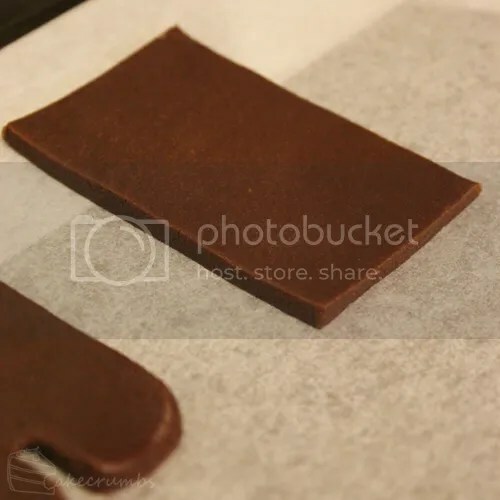 Roll chocolate dough between two sheets of baking paper until 4mm thick. Roll the red dough between two sheets of baking paper until 2mm thick so that Domo’s mouth will be recessed. Refrigerate for 30 minutes. 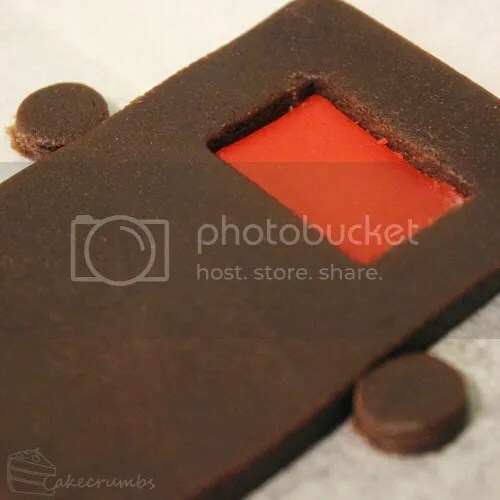 Cut dough into 6x10cm rectangles and transfer to baking tray. Round off the edges. Cut a small rectangular slit at the bottom of the dough for the legs and round these edges off too. Cut small rounds of dough and place them in the middle of the longest side for arms. 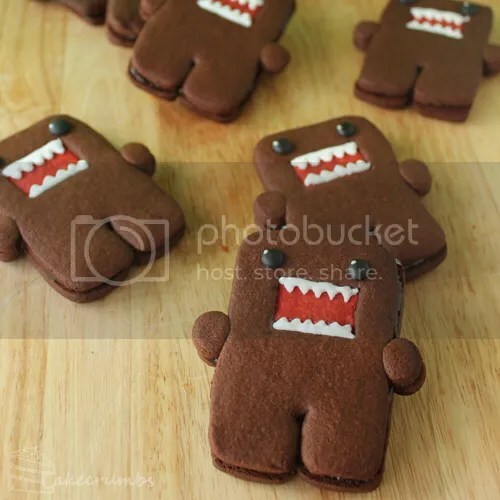 For half of the cookies, cut a small rectangle to make domo’s mouth. Replace with the same size portion red dough, pressing gently to fill in the space. Bake for 10-12 minutes, until just before edges begin to colour. Remove from oven and leave cookies to cool on trays for 10 minutes, then transfer to a wire rack to cool completely. 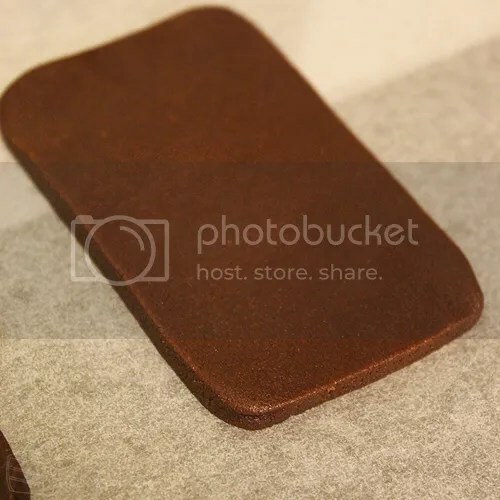 Melt chocolate over a double boiler; remove from heat and stir in golden syrup and butter until mixture is smooth. 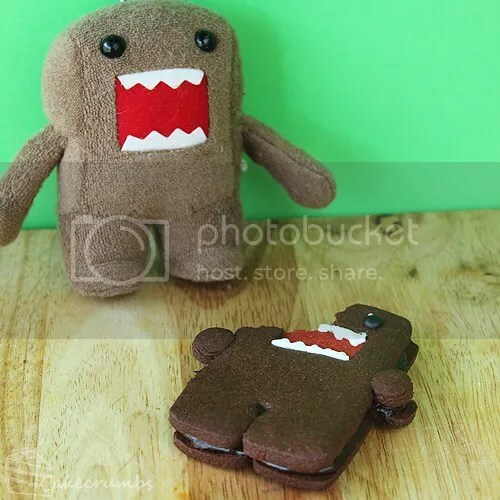 Spread a layer of fudge onto the mouthless portions of domo cookies. Place the other half of the cookies on top of these and press gently together to sandwich the cookies together. For domo’s features, pipe the outline of the teeth using a small piping tip and stiff peak royal icing. Use a few drops of water to let down the icing, then use this to flood the teeth. Reserve a tiny portion of the white icing, then dye the rest black. Use a 4mm piping tip to pipe domo’s eyes. With the reserved white icing, create the highlights on domo’s eyes. You may pipe these as well, however I found it easier to dip a toothpick into the icing then dot the highlights onto the eyes with it. 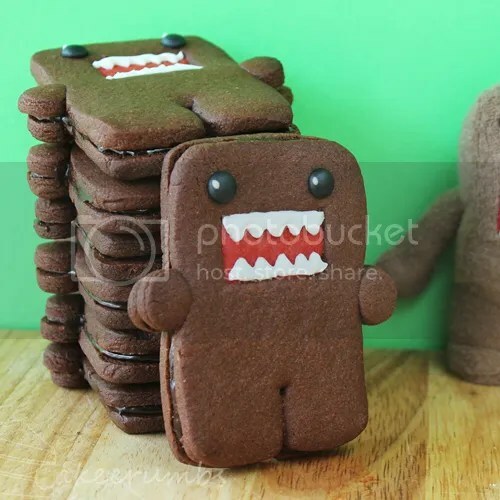 I am so totally making these on the next birthday of a friend with a Domo obsession! Ditto the above comments. Well apart from me making them. 😛 What do you think are my chances of her sending some back here for me to try? 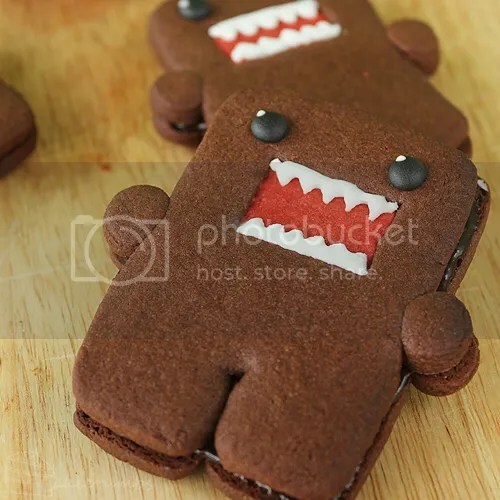 I wish I knew someone who liked Domo, because I would definitely make these! Then again, who needs a reason!? Not only do these look amazing and delicious, but they also appear to be relatively easy to make! It REALY good! She made the Domo Cookies as well!